In your Oro application, you can add calendars with tasks and events related to a specific user, other users in the system (subject to the roles and permissions defined), as well as events defined for the whole organization or system. Events in the system and organization calendars can be viewed by all the users within the system/organization. The ability to create, edit, and delete events depends on the user’s roles and capabilities. See a short demo on how to create and manage calendars, or keep reading the step-by-step guidance below. 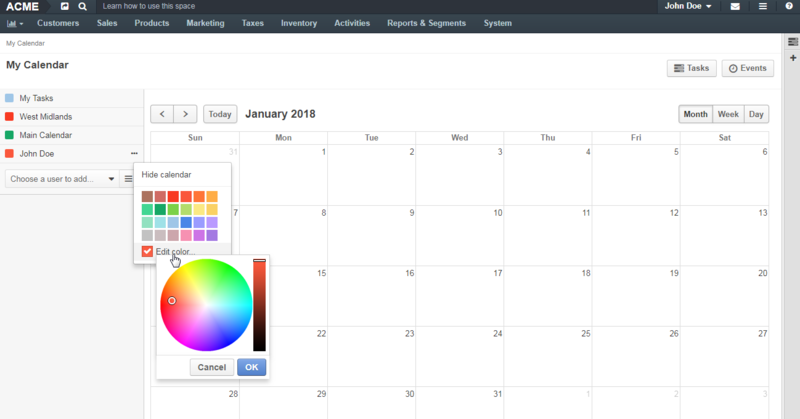 You can create as many calendars as you need under the System menu in your OroCommerce application. Navigate to System > System Calendars in the main menu. Click the Create System Calendar. Calendar Name This is the only mandatory field. Defines the name used to refer to the calendar in the system. Color Choose the color used to highlight events in the calendar by default. Scope Define if this is a system or organization calendar (meaningful for enterprise edition only). From the page of the system calendar under System > System Calendars. From My Calendar under your user name on the top right. You can find detailed information on adding calendar events to user calendars in the Calendar Events topic. My Calendar shows you all user and system calendars subject to the permissions of your organization. You can reach My Calendar from the Today’s Calendar widget on the dashboard, or from the menu under your user name. You can add or remove calendars that you want to watch from the calendar panel on the left. By default, you have My Tasks calendar showing your tasks by their due dates, all existing system calendars, and your personal calendar. To start watching calendars of other users, select a user by clicking Choose a user to add. Use the search field to quickly find the required user: start entering their name and click the required name from the dynamically filtered suggestions. You can also click the hamburger menu next to the list to select the required user in the dialog box using filters, etc. Hover over the calendar name in the panel to the left. Click the ellipsis menu that appears at the end of the corresponding row, and click to choose the desired color (either from the default color box, or custom color wheel). Click on the selected calendar from the list in the panel to the left to show or hid it. Alternatively, click the ellipsis menu at the end of row of the selected calendar, and then click Show calendar/Hide calendar. Hidden calendars do not appear in the right part of the page and in the Today’s Calendar widget. Hover over the name of the selected calendar. Click the ellipsis menu at the end of the corresponding row, and then click Remove calendar. You cannot remove My Tasks, system calendars, and your personal calendar. You have not given any response to the invitation. You are the event owner and are not required to respond. Accepted — You have agreed to attend the event (you have responded Yes to the event invitation). Tentatively Accepted — You are not sure whether you are going to attend the event (you have responded Maybe to the event invitation). You are not going to attend the event and have declined the invitation (you have responded No to the event invitation). This is an event from the system calendar. The calendar record represents a task. The Reminder icon in appears when the event owner set up reminders about the event.